On Monday evening I attended the first of the Friends of Barnsley Archives' talks to be held in the Learning Lab at Experience Barnsley at Barnsley Town Hall. The room is a bit smaller than the one under the library that the group used to use, but bright and well equipped. Teas, coffees and biscuits made a welcome return too after they have been missing for the last few talks at the library. This month's talk was by Paul Stebbing, Chief Archivist and Local Studies Officer at Barnsley Archives which now also lives in the Town Hall. He chose to tell us, using lots of pictures, firstly about the move from their old location to their new and had included some interesting photos of the actual basement archive store - a part of Barnsley Archives mere mortals like me never see! I am familiar with the roller shelves idea from the televison, but seeing that we (happy to confess a personal interest if only as a sometime volunteer and regular visitor) have such marvellous things in Barnsley is quite cheering. 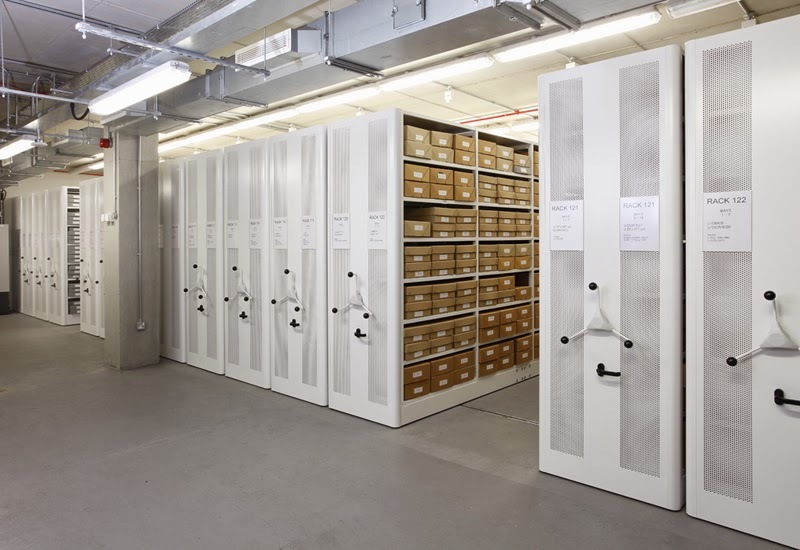 It seems that even with the new, greatly increased capacity, there is still not enough room for all of the Barnsley Archives collection to live at the Town Hall, however a huge amount has been brought in from the outstores meaning that asking for most items now only means a five minute wait instead of a two week delay as sometimes happened in the past. The Archive staff take turns working downstairs and are in contact by radio at all times - when an item is requested by a visitor the slip is sent down and the item sent up using the dumb waiter, a little lift in the desk area, and the staff let you know that it has arrived (or not - see below!). Paul then went on to describe some of the collections that have been moved into Barnsley Archives from Sheffield since the new storage has been available. He also described how we can access these treasures using the Archives catalogue, the green and blue binders on the open shelves of the search room. My only criticism of his talk is that I think I and some of the other people in the room would have liked to have known more about the various documents he showed us - a quick glimpse of a difficult to read mass of old writing doesn't fire up the imagination (please forgive me Paul, but I am not a medievalist and my O level Latin was a long time ago!). He did, however, zoom in on a couple of words in one document, showing us that it definitely said Brampton Bierlow, albeit an old interpretation of the words - that's the kind of thing I'd like to see more of please! 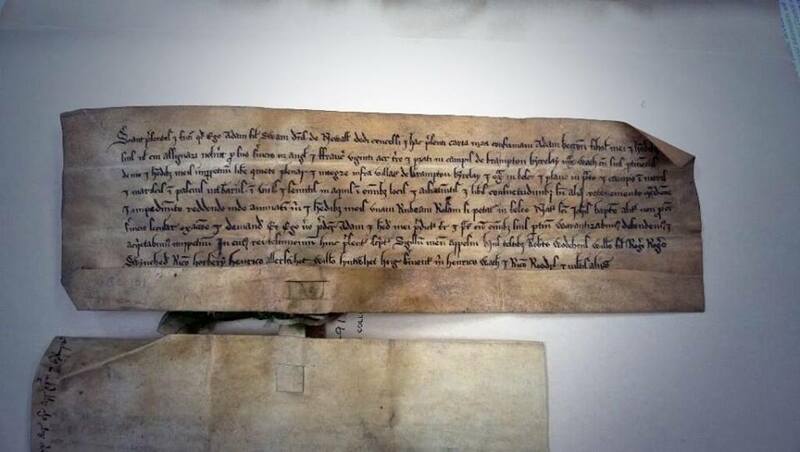 He also briefly showed us the oldest document now held by the Archives, which I have written about before, a grant of land by a man to his godson, payment being just one red rose a year. I suppose he was just giving an overview - and didn't really have time for indepth examinations - maybe the topic of another talk? On several occasions during the talk Paul also noted that the collections, or the specific items he was highlighting would be ideal topics for further study. One collection that interested me was the Elmhirst papers, having written about two fallen sons of the Elmhirst family early this year. I don't think I've got time at the moment though! On Thursday I visited the Archives myself. My first task was to assist a new volunteer researcher for the Barnsley War Memorials Project in starting to use the resources of Barnsley Archives in discovering more about the fallen men from Darton, his chosen area of study. Darton is unusual that there are no names on the war memorial in the churchyard, however last week another lady who regularly volunteers in the Archives pointed me in the direction of a History of All Saint's Church, Darfield and a list of men whom the church warden thought should have been on the memorial. We were very lucky, and hopefully ML was inspired, as the first name he chose from his list dutifully appeared in the baptism records of Darton Church on Ancestry and the various census returns. We also found his World War One British Army Service Records on Ancestry (free to use in Barnsley Archives and most local libraries in the Barnsley area) which gave ML an insight into his life before and during his enlistment. There were even a couple of hits on the name in the digitised Barnsley Chronicle - although no photograph. I explained that sometimes the Barnsley Independent, available on microfilm, is better for photos, my friend GB, who is researching the men from St Edward's church in Kingstone, has found longer obituaries in the Independent than in the Chronicle too. My own set task for the day was to research Charles M C Sorby, the son of the Rector of Darfield, who was killed on 8 May 1915 near Ypres. I posted pictures of his battlefield cross and memorials in Darfield Church on the Barnsley War Memorials Project site earlier this week. Knowing his date of death, he was fairly easy to find in the digitised Barnsley Chronicle by simply searching May 1915 for the word Sorby. The OCR (optical character recognition) used to scan the Barnsley Chronicle sometimes doesn't recognise words in capital letters only, ie SORBY, so it was no surprise to see that it picked out his name in the body of the article I found but not in the title. When I got home a more through read of the article that I had found, which was dated 29 May 1915, suggested there might have been previous reports of Charles' death in the newspaper which the search tool had missed. I will have to go back next week and do a full visual search of the previous two week's issues to see what else I can find. I continued my search forward in time until I found a report for the dedication of his memorial window in Darfield Church, which took place in June the following year. Finally I turned to the green catalogue binders that Paul had described in his talk on Monday. There is one labelled 'N' for Non-conformist and I had been piqued by this during the talk - it hadn't occurred to me before but the various churches and chapels will probably have recorded the planning and erection of their war memorials in their minute books and maybe list of names or receipts for work carried out might also have been saved. I was determined to search through the entire catalogue looking for mentions of the First World War. Michael, one of the Archive assistants, gave me some invaluable help and a quick look at the Archive's own electronic catalogue too. We did better with "Programme for a Memorial Service for Scholars Killed in the War" from the Methodist Chapel on White Cross Lane in Cudworth (now a dance studio) - that came up in the dumb waiter in a neat cream envelope and turned out to be a typical church service sheet, a folded page with fancy title page and the words to various hymns BUT it also contained photos of two memorial tablet which were unveiled in the church on the occasion of the Memorial Service. 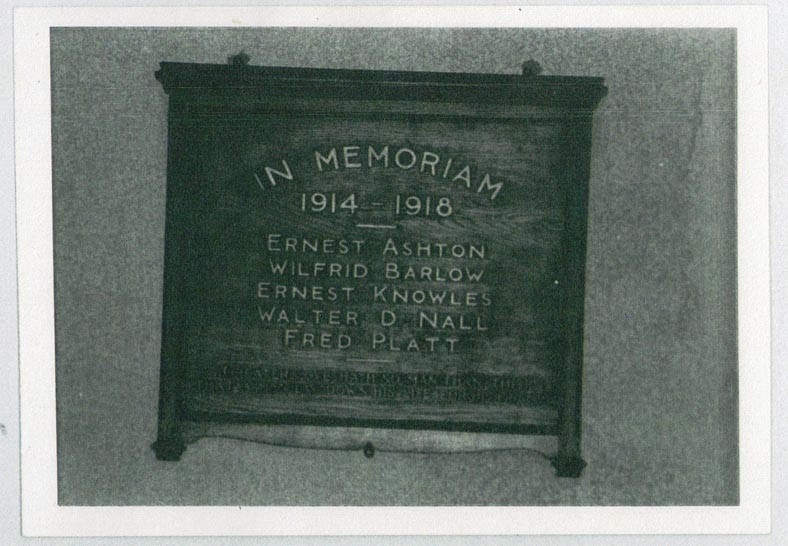 All the men named are also on the Cudworth War Memorial, but now we know that they attended that particular Methodist Chapel rather than (or as well as) the parish church. I will be posting the images of these tablets on their own page on the Barnsley War Memorials Project website. Another great find was a packet of old photographs from Netherfield Chapel at Thurlstone (now a house). 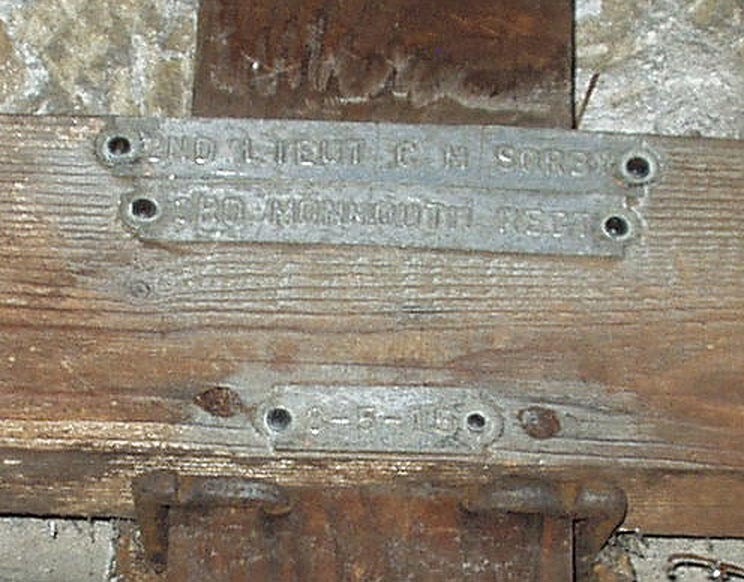 There was a small photo of a wooden plaque bearing five names. It's quite dark, but a bit of playing around in Photoshop might help ... the men listed are all on the Penistone War Memorial - it's so easy to check now on the Barnsley War Memorials Project pages! But I wonder what happened to this plaque (and the ones from Cudworth) when the buildings went out of use as chapels? I had three other references - one was out of area - an interesting display card for the men who served from Hickleton Main Colliery - I suppose some of them might have come from Goldthorpe or Thurnscoe but I didn't ask for a copy - to be honest I had overspent my £2 budget already! The final two items were also proving difficult to find as I left the Archives at 2.45pm for another appointment. Michael did say that he would keep looking for the list of names from the "War Memorial at the Wesleyan Reform Church, Hunningley Lane" and photograph - 1994, as he had an idea that it had been recataloged. 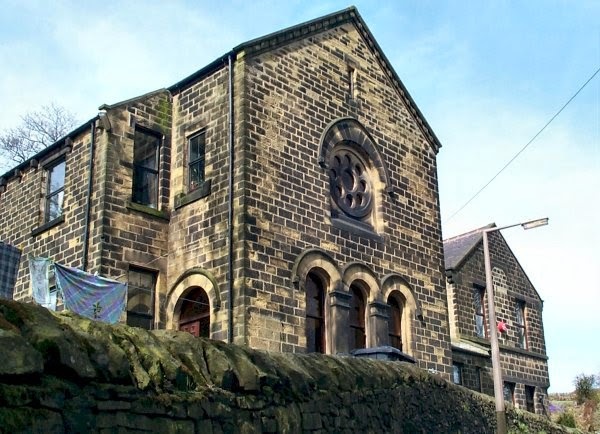 But the list from the Ebenezer Methodist Chapel, now demolished but previously on junction of Sheffield and Doncaster Road (near the Alhambra roundabout) was proving as elusive as the first item, the "various rubbings". It almost felt as if someone else had ordered up these same items and they had been put back in the wrong place? Hopefully they will turn up one day! Thanks for reading and I'll now be off to make some new War Memorial pages! I will ask Margaret and take photos when I go and fit a door and frame in the next few weeks.